A must-do activity if you wish to enjoy the scenic beauty of tropics from thousands feet above the land! In early morning, the balloon will take you high above the sky, letting you fly with the first birds of the dawn. The magical and memorable part of this trip is the balloon itself. It floats with the wind. That’s why; this tour is generally held in early morning as the wind remains at its calmest mood at that time. Missing out this trip will be sheer lifetime miss for you. Various tour operators and hotels arrange these tours for the tourists. Else, you can book locally as well. Timings of this tour varies among operators. Recommended time to visit : 6am – 11am. Ticket prices are also different for different tour operators. Tour operators do take the responsibility of your safety. 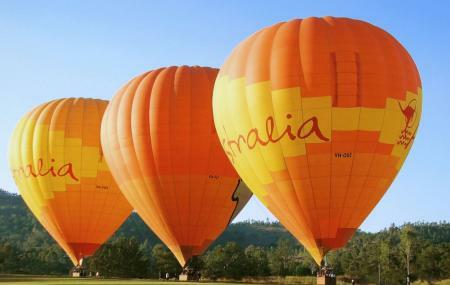 How popular is Cairns Hot Air Ballooning? People normally club together Great Barrier Reef and Muddy's Playground while planning their visit to Cairns Hot Air Ballooning. People also prefer to end their day with Cairns Hot Air Ballooning. This experience was well worth the 4am start. It was a relaxing ride with our professional pilot who has 11 years of experience flying balloons. I always felt safe and comfortable during the flight. Afterwards, they even dropped me off at Kuranda. The day we went to the Hot Air Balloon in Cairns could not have been more perfect. Our driver who picked us up was very entertaining and she answered all of the questions we had. When we arrived to the field they already had the balloons ready to go and we were able to get in and leave pretty quickly. I'm normally not a fan of heights but this was the smoothest ride I have ever been on. Our balloon driver was great. He explained the mechanics of the balloon, the vegetation on the ground and he even pointed out some wild wallabies and kangaroos for us! And the landing, we didn't even tip over! Best balloon trip yet! Booked a trip for my mother, she had a great time. Festival atmosphere by the pilots and staff keeping the group entertained. The fun is in 3 parts, watching balloons lined up and filling in the sunrise, the balloon ride itself, and balloon chasing in 4wd and bus across the landscape. A 30 minute ride but couple hours of fun.